Race 7 on the 2018-19 SBMRL calendar takes us to Magny-Cours, France. The Circuit de Nevers Magny-Cours was originally constructed in the 1960’s and saw Formula 1 race there in the 1990’s and 2000’s. It has played host to the SBMRL once previously, which took place two seasons ago. 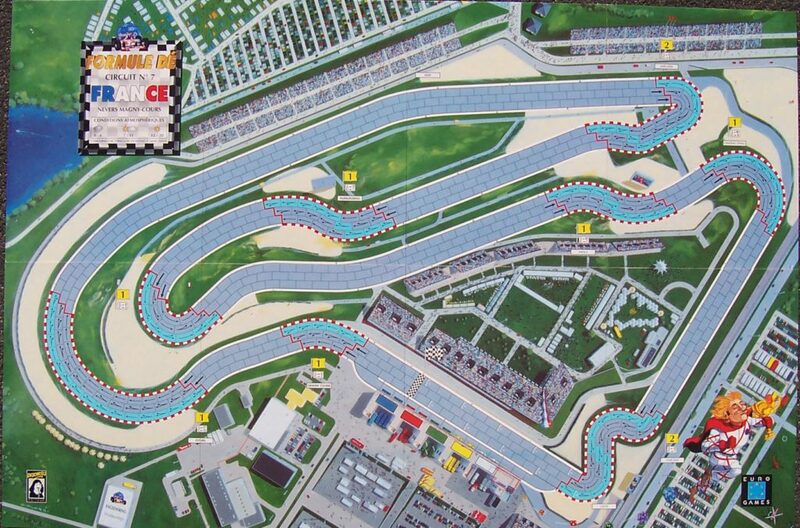 A clockwise circuit, Magny-Cours is known for its extremely high speed stretches. It will certainly tax the engines as they rev to full throttle. The pit straight is fairly short, with a quick left hander called Grande Courbe to open things up. From there, a smooth right by the name of Estoril can be taken pretty much as fast as the cars are able to push. The long Golf straight that follows is one of the longest we’ll see this year, and the cars will be flying down it as fast as they possibly can. The Golf straight ends at the sharp Adelaide hairpin, one of the hardest braking corners this season. Expect some cars to get it wrong here, but it may be a case of fast in slow out as a preference over the norm. The straight that follows isn’t particularly short, but the Nurburgring corner is more of a slight shuffle than the chicane it is officially listed as. The next corner is a 180 degree bend to the left. Were it sharper, it’d be a hairpin, and were it less sharp, it would resemble the Estoril corner from the first sector. As it is, it’s basically the inside line of that corner heading back in the other direction, and it falls between the two extremes. It’s followed by a relatively lengthy straight before the Imola chicane, a bend similar to the Nurburgring corner seen earlier. Chateua D’Eau follows Imola in quick succession, one of the only real rhythm combinations on the track. A moderate straight and the Complexe du Lycée is all that stands remaining before the pits. Each team sports a driver in the top 4 and each team has one in the bottom four, highlighting how evenly matched things are this year. Magny-Cours is the home race for both Jaap and Rask. While Magny-Cours has only held one SBMRL event, it was an eventful one. Launch took the victory after starting in 6th place on the grid, so it’s clearly a track where every driver has a legitimate shot at victory. Only Launch, Jaap, and the Stig participated the last time out. The Stig finished 7th and Jaap crashed out, so they’ll be looking for some redemption. Jamonito del Verde and Mater were the other two drivers on the podium. This entry was posted in Race Previews and tagged France, Magny-Cours. Bookmark the permalink. Love your page and league rules! Just curious, and I may have missed it, but how many laps do you run in each race? Thanks! We race 2 laps per race. Slightly modified advanced rules with no weather/tire selection.